Jaymi’s pursuits are a revenge fantasy taken to the next level, with moral and ethical quandaries wound in. Magical realism meets old school noir in Rohan Quine’s technological thriller The Beasts of Electra Drive, which poses philosophical questions around reality, humanity, and where to draw the line with tech-infusion. Game designer Jaymi Peek is an innovative storyteller and a coding genius whose skills made him rich. As the company he works for gets lazier and lazier with the quality and substance of their products, Jaymi decides he cannot be associated with their garish media. He breaks off on his own to reinvent how the world looks at video games. His newfound creative freedom, coupled with the tasteless and potentially dangerous style of his old company’s new game, lead him to an epiphany: He decides to code his characters into the real world. Still, the plot is straightforward and easy to follow. Jaymi’s intentions remain consistent; his mission is clear early on, and is maintained throughout. Pacing is rigidly structured and follows a clear formula; each time a new character is introduced—and they are introduced frequently—the text follows the exact same setup as with previous characters. Jaymi’s pursuits are a revenge fantasy taken to the next level. At times, he appears to have moral quandaries about his drastic actions against a rival company. His cyber-creations also lead him to question the nature of existence and his role as a creator—can he ethically order his creations to do his bidding in the real world? The story leans toward dissecting the complexities of empathy, but ultimately does not go much further than momentary introspection. Despite his considerations, Jaymi does not grow or change throughout the novel; his dedication to enforcing his worldview and disallowing others to live according to theirs leaves a bad taste in the mouth. He has more consideration for his characters than for actual people. As the plot moves forward, Jaymi’s revenge becomes less a matter of fantasy than a disturbing reality. The characters that Jaymi creates are refreshing in their diversity of race, gender, and sexuality. The two distinctly male beasts conform to the spectrum of masculinity, with one, Amber, being excessively violent, athletic, and handsome, and the other, Kim, being introverted but boundlessly intelligent and philosophical. These two men are in relationships with Shigem and Scorpio, who are more fluid in their gender and sexual identities. Shigem and Scorpio, along with Evelyn, are of varying nonwhite ethnicities. The scope of variety among the beasts is a nice change of pace. 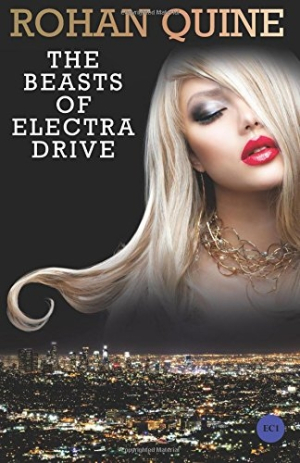 The Beasts of Electra Drive is a techno-thriller that focuses more on its beautiful prose than on nurturing its thrills. Although sometimes repetitive in format, the vitality of the characters is pleasant and engaging.